On Sunday 20 November, the Feast of Christ the King, Pope Francis closed the Holy Door in St Peter’s Basilica, officially marking the end of the Jubilee of Mercy. ‘This Year of Mercy invites us to rediscover the core, to return to what is essential,’ the Pope said. After closing the Holy Door the Pope processed to the square outside, where he celebrated Mass with 70,000 pilgrims present. Pope Francis encouraged pilgrims to pray for the grace to never close the doors ‘of reconciliation and pardon,’ explaining that just as God believes in us beyond any of our own merits, ‘so too we are called to instil hope and provide opportunities to others. ‘Even if the Holy Door closes, the true door of mercy which is the heart of Christ always remains open wide for us,’ he said. He offered thanks for the many pilgrims who during the Jubilee crossed the Holy Door away from ‘the clamour’ of daily news and tasted the ‘great goodness’ of the Lord, and asked Mary to intercede for us as the Holy Year comes to an end. 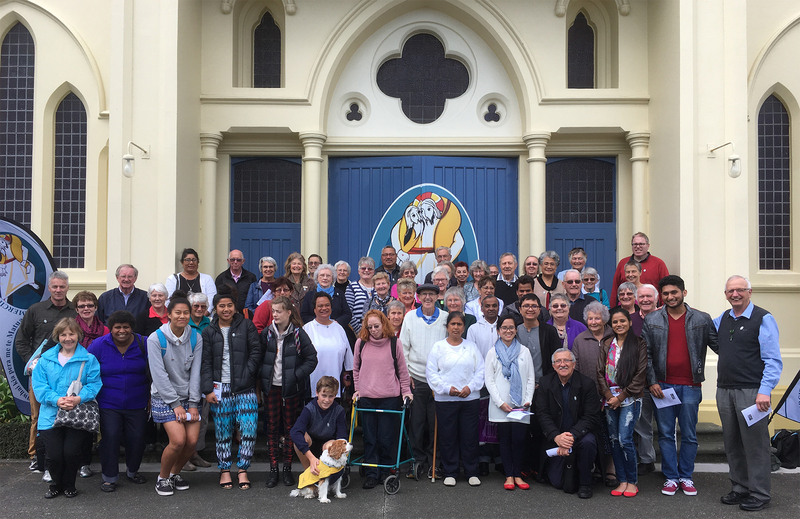 A group of 59 parishioners from the Catholic Parish of Napier – Te Parihi Katorika ki Ahuriri, sang their way through the Holy Doors of the Cathedral of the Holy Spirit, Palmerston North, on 29 October. The mission statement includes ‘to reach out to the poor and serve the people of Napier’. Fittingly, the pilgrims reflected on the question: ‘How will you personally respond to the parable of the lost sheep?’ (Luke 15:4-7). The Jubilee Year of Mercy may have ended, but the task of mercy continues for all parishioners as they continue their earthly pilgrimage. The Holy Doors of the Cathedral of the Holy Spirit closed on Sunday 20 November. Fr Brian Walsh, Vicar General, led the congregation from the Cathedral at the end of 9.30am Mass to gather on Broadway, where he formally closed the doors and sent parishioners to live the Gospel of Mercy in their daily lives. Since then the doors have had the symbol removed but the mural of new life remains. The Doors of Mercy Remain Open!